More wacky combinations crop up in Emma Dodd's No Place Like Home: A Crazy Criss-Cross Book of Animal Mix-Ups. ""Diving in the deep blue sea/ Is not where camels want to be."" Woven with strips of paper, a picture of the out-of-place animal appears on the opposite page; a mighty tug of the accompanying levers reveals a creature better suited for the environment in question. 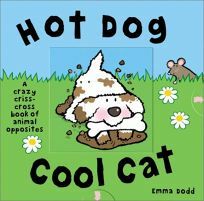 Hot Dog Cool Cat: A Crazy Criss-Cross Book of Animal Opposites follows the same format with animals found closer to home.